“Pop” McKale brought Frank “The Grey Fox” Sancet to the University of Arizona in 1947 as assistant baseball coach. He also was backfield coach for football, freshman football coach and freshman basketball coach during those early years. In 1950 he took over for Pop as head baseball coach and went on to distinguish himself over the next 23 seasons, leading the baseball Cats to four conference championships and ten trips to the College World Series. Frank brought Arizona baseball a national reputation for excellence. He coached 28 All-Americans and 66 of his players signed professional contracts. He was the second winningest coach in the history of college baseball with a record of 832 wins, 238 losses and 8 ties. Sigma Chi national fraternity awarded him its highest honor, “Significant Sig,” for his accomplishments in college baseball. The same year he was inducted into the Arizona Sports Hall of Fame. 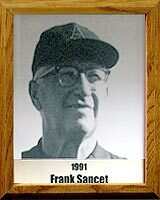 Frank was posthumously honored when Wildcat Field was renamed Frank Sancet Field.